A shorter version of this story was published in the Rocky Mountain Outlook on Nov. 7 by Rob Alexander. Shortly afterwards, Trotter, one of the commanding officers of the 14th Canadian Tank Regiment (The Calgary Regiment) was dead, as were two of his comrades. 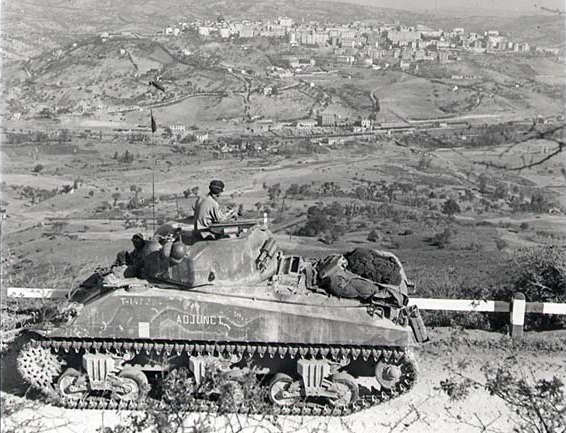 It was Oct. 1, 1943 and a Canadian vanguard comprised of artillery, infantry, reconnaissance, engineers and tanks had left the city of Foggia early that morning; eight hours and 40 kilometres later, the Sherman M4 tanks of The Calgary Regiment were rumbling into battle alongside soldiers of the Royal Canadian Regiment to take the small hilltop town of Motta. The advance guard, led by The Calgary Regiment’s commanding officer, Lt.-Col. C.H. Neurotsos, passed quickly through the heavily bombed city of Foggia and turned northwest. Well in front of the advance guard, the fast-moving vanguard was probing the foothills of the Apennine Mountains, searching for Germany’s elite 1st Parachute Division. The 1st Canadian Division had been ordered to clear the way from Foggia through to Campobasso, a mountain town in the centre of Italy high in the Apennines which, once taken, would open a route for the British 8th Army to attack Rome. Germany’s 1st Parachute Division made good use of those defenses, harassing the Canadians from strong vantage points. But,when push came to shove, the enemy would abandon a position and disappear into the night to establish its next “line of resistance,” giving Germany time to build defensive fortifications across Italy from the Adriatic Sea to the Tyrrhenian Sea. The Canadians would encounter this line of resistance strategy at Motta. The Princess Louise Dragoon Guards reconnaissance regiment discovered the defenders when their armoured cars came under fire at about 8 a.m. The Dragoons immediately pulled back into the valley. By 1 p.m., strong German positions at four villages facing the Foggia Plains flanking Route 17 had stopped the vanguard. The commanding officers of each regiment committed to the vanguard and the advance guard met for a quick operational meeting to plan the coming attack. Without artillery available to them (the field guns were stuck in traffic), Lt.-Col. Neurotsos decided to go forward with a joint tank-infantry attack on Motta at 4 p.m. Parts of “A” and “B” Squadrons of The Calgary Regiment would surround the town, while the rest of “A” Squadron, backed by the Royal Canadian Regiment, would take the town. “Talking to Bruce Trotter after the meeting, he asked me what I was going to do, as he had heard my orders. I told him I would be right behind him where he went. His reply was ‘Thank God for that, this is bloody suicide,’” Alexander wrote. Medical personnel accompanying the vanguard and the advance guard had been ordered to stay back from the attack on Motta. Both tankers and infantry felt the plan was hasty and dangerous with nightfall only two hours away. And with limited artillery support, Alexander added the Germans would be able separate the Canadian soldiers and the tanks – an old and deadly trick. Without infantry to protect them, tanks would be easy targets for close-quarter attacks in the narrow town streets. The attack, however, went ahead as planned. Taking advantage of high points on the ridge, the German defenders quickly pinned down the RCR with heavy mortar and machine-gun fire, separating them from the tanks. The tanks, however, continued up the hill with three “A” Squadron tanks – Amos, Andy and Archie – in the lead. Amos, commanded by Lt. Arni Charbonneau, a former Ottawa Rough Riders halfback, took point and began to climb the narrow, twisting road. A kilometre up the road, Amos rounded a corner and was greeted by the muzzle flash of a German 88mm gun, feared for its power. The first shell plowed into the road and came to rest under the tank, according to Amos loader-operator Peter Reimer in a draft of the story that would be later published in Legion Magazine in 1991. Amos would be dubbed the “miracle tank” in an Oct. 3, 1943 story in the Globe & Mail. Cpl. Ted Court, Amos’s driver, immediately backed up the tank, as the 88 crew fired two more shells; the first landed just shy of the front of the tank and the second slammed into the crest of the hill as Amos disappeared behind it. Arni Charbonneau, Amos tank commander. Members of the Calgary Regiment, possibly two tank crews from “A” Squadron with a commanding officer. Amos gunner Jack Haase is believed to be the man standing in the back row, second from the right. Amos, Andy and Archie left the road and travelled along the hill, flanking the gun emplacement. Amos’s gunner Jack Haase opened fire on the surprised 88 crew with the Sherman’s 75-mm cannon. The German crew abandoned their gun and fled for the safety of the village. According to Reimer, one of the German gunners slipped an explosive collar over the barrel that detonated damaging the 88 as he ran after the other men. 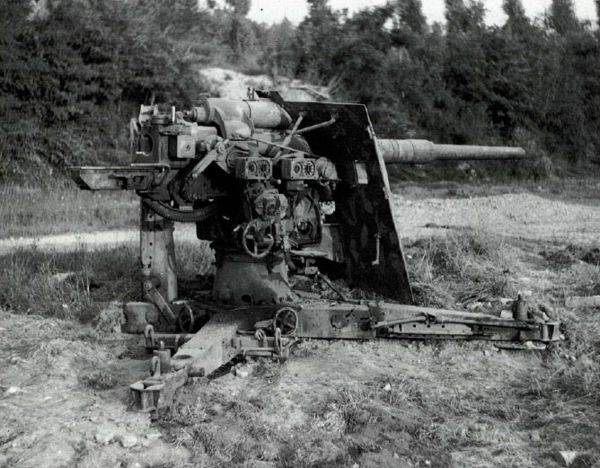 A German 88mm gun in the anti-tank role. When Amos entered the town the 31-tonne tank passed over a mine buried in the road. The explosion lifted up the front of the tank. Amos dropped heavily back to the road and lurched into a stone building. Court backed up and reported the tank was losing oil pressure. Charbonneau gave the order to continue forward; their goal was the centre of the village a short distance away. A sharp turn to the right brought Amos into the line of fire of a 50mm anti-tank gun (known as a “squeeze gun” as the barrel squeezed from in size from the chamber to the muzzle, increasing the velocity of the shell) sitting in the middle of the street. The Sherman plowed into the gun and immediately stopped – high centered on the wreckage. The crew didn’t know it at the time, but the loss of oil pressure had come from a direct hit on the rear of the tank from a second 50mm anti-tank gun concealed near the entrance of town. The gun crew that damaged Amos also stopped Andy: a shell from the gun punched a hole in the tank’s right side and killed the co-driver, 25-year-old Trooper Victor “Polly” Palsson. With Amos trapped on the wreckage of the anti-tank gun, Andy knocked out and Archie withdrawing, a despatch rider on a motorcycle roared up to the advance guard waiting down at the bottom of the ridge and passed on word that two other tanks had been hit halfway up the hill, leaving dead and wounded. Alexander sped up the twisting hairpin road towards the town. 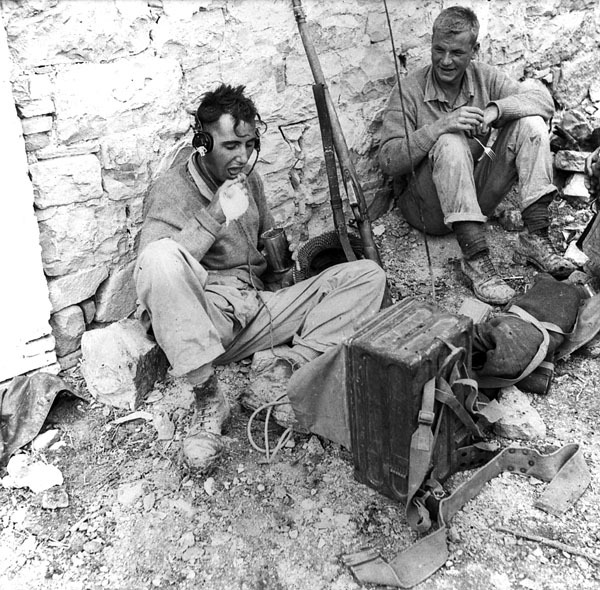 “There is heavy German machine gun and mortar fire, but we are a small target, it is getting a little dusk and we are travelling very fast, so do not run afoul of any of his fire. When a little over half way up the hill we see the tanks, and see a number of men lying alongside,” he wrote. “Three are badly wounded, we attend to them, load them on the Jeep ambulance and Slim and Art start back to the Reception Station with them. I remain on the hillside and go on with the work of looking after the injured. There are two minor wounds, which I attend and then go to examine the dead: Bruce Trotter and Sgt. Bernard (Curly) Lynch. Trotter, 28, who had been standing up in the turret with the hatch open, was killed not far from the attack’s start line when a mortar shell dropped onto the top of the turret. Lynch, 30, was also killed during that barrage. Seven other tankers were badly wounded. 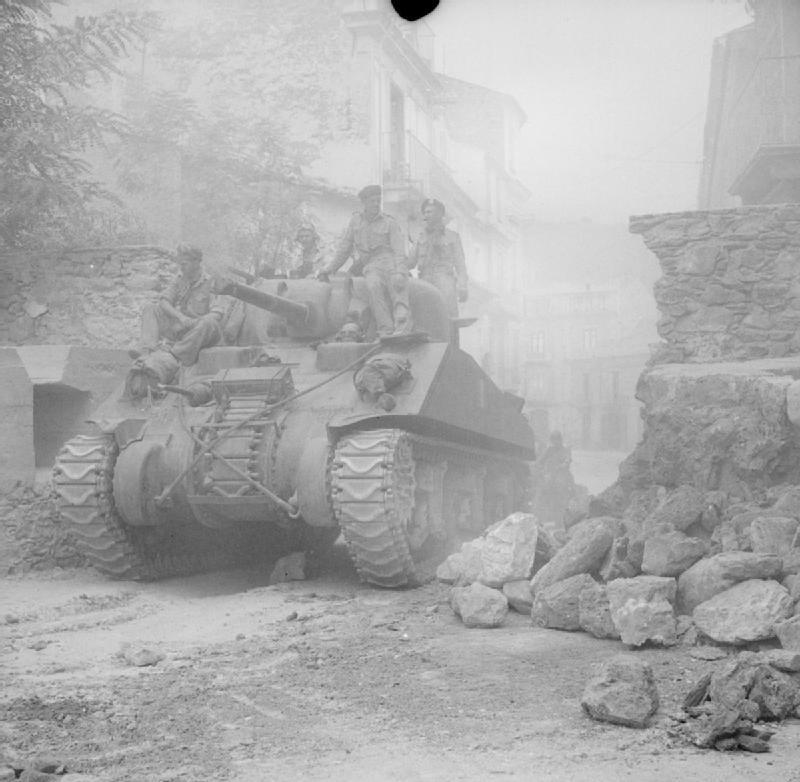 A Sherman tank passes through Nicastro, 11 September 1943. The crew of Amos, meanwhile, was still under attack. The tight confines of the narrow streets of Motta allowed German soldiers to run up to the Sherman and clamber on board. The five members of The Calgary Regiment trapped inside the tank were shocked to see a hatch open. Charbonneau slipped a wrench through the handles to lock down the hatch. The crew frantically traversed the turret as Haase fired the turret-mounted machine gun to chase off the German soldiers. The soldiers took cover behind a nearby house and began lobbing hand grenades under the tank, possibly aware that Sherman tanks have an escape hatch in the floor. Reimer opened the breech and, sighting down the cannon, lined it up with the corner of the house where the German soldiers were hiding. When a soldier stepped out from behind the house to throw another grenade, the crew fired the turret machine gun, killing the man. As day turned to dusk, another Sherman arrived, just as the tanks were being recalled with the coming night, and pushed Amos off the wrecked anti-tank gun. Free of the wreckage, Court accelerated and Amos jerked forward and then stopped. One of the tracks had snapped. With darkness protecting them, German soldiers began placing small bombs – perhaps up to a dozen – on the armour over the gas tanks. Each one shook the tank and the sound echoed through the tight confines of the tank’s interior. Finally, one of the bombs penetrated the gas tank and flames filled the turret. Charbonneau, Haase and Reimer scrambled from the tank via one the hatches shortly before machine gun bullets began exploding inside the hull. On his way out of the tank, Haase burned three fingers on his right hand. The three men jumped over a stone wall and ran, leaving Motta behind them. Court followed closely behind his three friends taking a similar route. All four tankers reach the Forward Defense Line manned by the Royal Canadian Regiment. Co-drive Duke Ross, however, remained in the tank when the gas tank exploded. As the other members scrambled from the tank Ross fired the bow machine gun spraying some 250 rounds the German soldiers who were trying to gun down his buddies. Ross dove from the tank amid bullets bouncing off the tank fired at him by the remaining German paratroopers. He got behind the tank, and using it for cover, ran down the road, the way they had come when the Canadian Shermans had first entered Motta. Before going too far though, he stopped, took his boots off and continued running in silence. Ross hid in a hole in a gutter until early in the morning when the RCR attacked the town. After the attack on Motta, the crew of Amos attributed their survival, in part, to the fact the tanks went into battle low on fuel saving the tank from exploding outright when the bombs finally penetrated the gas tank. Reimer also attributed their survival to their tactic of sighting down the cannon barrel to aim the .30 calibre Browning machine gun and stop the grenades from being tossed under the tank. The next day, Ross discovered a small brass ring stuck in the skin of his leg. Grenade sharpnel was coming into the tank through the damaged escape hatch in the bottom of the tank. At some point during Amos’s run into Motta, it appears Haase destroyed a second 88 mm anti-tank gun. According to Haase’s great nephew Clint Weimer, Haase hit an 88 at 1,200 yards (just over one kilometre). The Calgary Regiment’s war diary indicates knocked out two 88 mm guns and several squeeze guns during the attack on Motta. The Royal Canadian Regiment, meanwhile, took Motta during the night, but a strong counterattack at 2 a.m. pushed them from the town. After a massed Royal Canadian Artillery rocket propelled grenade attack from 2:55 to 3:05 a.m., the German defenders were once again forced from Motta. In the morning of Oct. 2, “C” Squadron tanks passed through Motta to continue the westbound run towards the ridge-top village of Volturara. An intense barrage from concealed anti-tank guns destroyed five tanks only a few hundred metres from Motta. Once back at Motta, two of the Calgary tank commanders, Al Mann and Frank Underwood, stop Alexander and tell him four wounded tankers are still lying at the site. Alexander asked for permission to go forward and bring the wounded back into Motta, but he was refused on the grounds that it was too dangerous. “It is horrible to know that my own boys are lying wounded and I can do nothing for them. The Town is still being shelled – one shell lands in a side street and there is a call for help – we rush in and put the wounded on the jeep – will dress them in our R.A.P. (Regimental Aid Post) just around the corner. One patient goes raving mad, and while trying to load him on the jeep another shell comes in, makes him almost impossible to handle, and a piece of shrapnel hits me a glancing blow on the head. It knocks me down and hurts terribly – which makes me think I know that it must be superficial and of no consequence. Thank goodness it was a glancing blow, as a direct hit with a slug the size of that would have been curtains,” Alexander wrote. On Oct. 3, as Canadians moved from Motta to once more begin the assault on Volturara, which sat across the valley, Alexander and his medical staff stopped to search the five burned tanks. 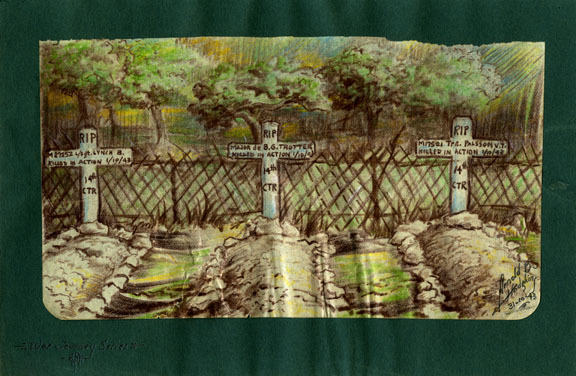 “The bodies are all burned beyond recognition, but I find eight and am able to recognize them by their positions in the tanks – we send word back to the padre, the numbers and location of the dead, and continue our advance to the cross roads one and one half miles west of Motta,” Alexander wrote. Edward Page, a member of The Calgary Regiment, interviewed by staff with The Memory Project, an initiative of the Historica-Dominion Institute, said he volunteered to help Calgary Regiment padre Capt. E.H. Costigan remove bodies from the burned tanks. 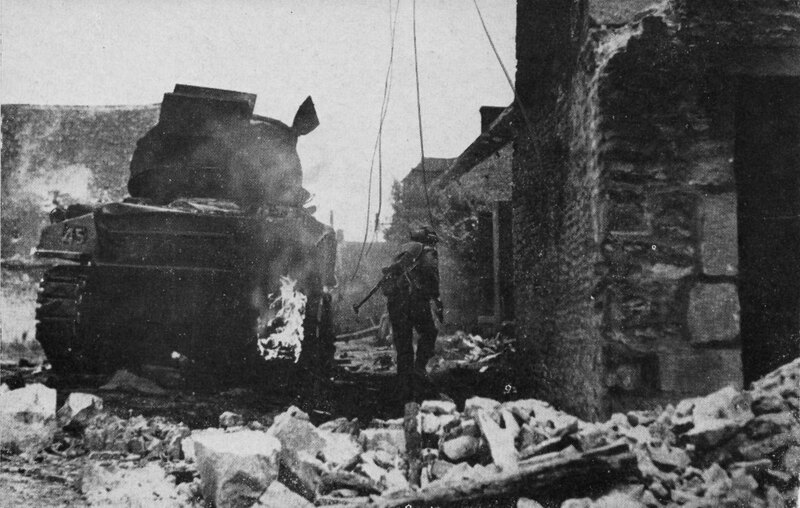 runs forward past a burning Sherman tank in the village street. Source. DND. On Oct. 4, with early morning fog blanketing the hills following a night of rain, tanks, artillery and infantry push on beyond Volturara and capture San Marcos, another small village where the First Parachute Division had made a stand. 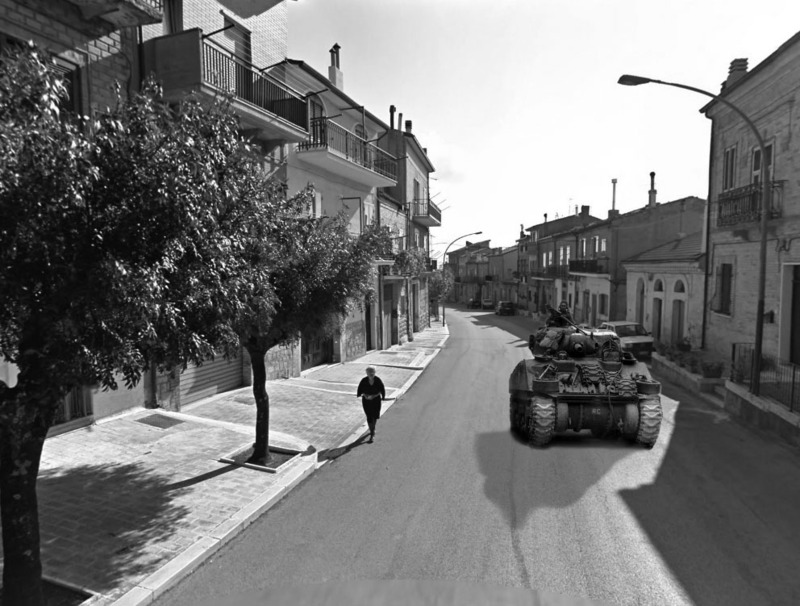 A composite photograph of a Sherman M4 tank advancing through a modern photograph taken from Google Streeview of Motta Montecorvino. The capture of Motta Montecorvino, Volturara and San Marco was only a small part of the Italian Campaign, which began in September 1943. Canadians were not there to see the end of the campaign with capitulation of German forces in April 1945. 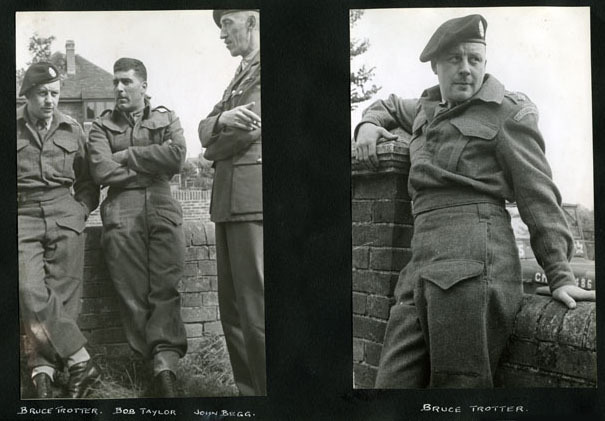 The 1st Canadian Corps was transferred to northwestern Europe in February 1945 where it joined the First Canadian Army. From the fall of 1943 through late winter 1945, about 21,000 Canadians were wounded and another 5,300 were killed. The Kingdom of Italy signed an armistice with the Allies on Sept. 3, 1943. Bruce Trotter’s premonition had been correct – the attack on Motta Montecorvino and Volturara was suicide. Without artillery, the German 1st Parachute Division (men described by British Field Marshal Harold Alexander as “the best German troops in Italy”) did indeed separate the tanks from the infantry as was feared. However, despite the losses, the Canadians still managed to capture Motta and Volturara, as they would other Italian towns and cities. Ten members of the Calgary Regiment, however, were killed and another 11 members were wounded during the attack on both towns, according to the Calgary Regiment’s war diary, but the casualties would later prove to be small, especially compared to the 56 casualties the regiment sustained in May 1944 at the Gari River. Sixty tanks were knocked out during that battle. Even though Motta and Volturara were taken, the loss of 10 men from the Calgary Regiment was still keenly felt. My thanks to Bill Kaufmann of the Calgary Sun for taking an interest in my grandfather’s story. He wrote a story – Wartime diaries bring Canmore journalist closer to grandfather he never knew – that ran Sunday in the Sun over a two-page spread sharing my grandfather’s story with Calgary and area readers. One of my goals with this project is simply to share what until now was a family story, and stories such as what Bill wrote truly help. For that I’m very appreciative. My thanks to David for a great interview and to Karen Moxley, CBC associate producer, for arranging it. On Monday, the Globe and Mail ran a story written by Carrie Tait about this project and Doc Alexander’s journals, specifically the Dieppe journal and his experience during the raid. The story can be found by clicking Dieppe remembered, 70 years later, through a grandfather’s red leather journal. It’s a great piece and I’m really appreciative of it, as it has helped to open Doc Alexander’s story to a wider audience. My thanks to Carrie.